The State Preservation Board Retail Division (dba: The Capitol Gift Shops and The Bullock Texas State History Museum Store) is committed to offering the widest possible range of items to its visitors. 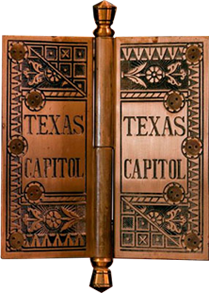 The Capitol Gift Shops and the Bullock Texas State History Museum Store (Museum Store) will offer visitors items related to: Texas (its history, its land, and its heritage), the Capitol, or State Government. It is the goal of the Retail Division to further the educational mission of both the State Preservation Board and The Bullock Texas State History Museum. In accordance with that mission, preference will be given to products with an educational focus. It is our goal to feature products produced in Texas by Texans. All other criteria being equal, preference will be given to Texas-made products whenever possible. Net revenue from the Capitol Gift Shops will help support continued Capitol preservation efforts, will provide a source of revenue for educational programming, and will help support the administrative operations of the retail operation. Net revenue from the Museum Store will help support the operations of the Bullock Texas State History Museum. 2. All items should reflect the mission of the State Preservation Board and/or The Bullock Texas State History Museum, should be of production quality, and should be suitable for display within a significant historic or educational structure on the State Capitol grounds. Only the highest quality products relating to the State of Texas (its land, history and heritage), the Capitol, or Texas State Government will be considered for the Retail Stores. 3. The Retail Stores will not carry products that promote any university; any professional sports team; or any specific Texas city, town, or region, with the exception of Austin, home of the State Capitol and The Bullock Texas State History Museum. 4. The Retail Stores will only carry periodical reading materials with a circulation of over 100,000. The focus of these periodicals will reflect the politics, interests and lifestyles of Texans or subject matter relative to the State of Texas. Exceptions to this policy may be made if dictated by special circumstances. Topics of the periodicals will cover the following: Government, the Economy, Travel, Sports and Leisure, Lifestyle and Gracious Living, Current Events, or History. 5. All publications in the Retail Stores will have an emphasis on resource information. While subject to exception, we will avoid carrying works of fiction due to our inability to give fair representation to the high number of Texas authors. 6. All other criteria being equal, preference will be given to Texas vendors. 7. When comparing similar products with other criteria being equal, the lowest wholesale cost will be the determining factor. 8. All products must complement existing inventory. 9. Preference will be given to products that have a demonstrated record of retail sales in a similar retail venue. 10. A majority of the products carried in the Retail Stores will have a retail price of $25 or less. 11. All products must achieve an acceptable level of sales activity within three months of receipt-of-order to be considered for continued representation in the Retail Stores. 12. Items must have the ability to be produced and shipped quickly and in reasonable quantities for resale. Unless otherwise specified on the purchase order, shipments must be received within 30 days of order. In order for your product(s) to be considered for inclusion in our Capitol Gift Shops and/or The Museum Store, you must first complete a Vendor Information Sheet. To download the Vendor Information Sheet click here. Discount: If you are a publisher, the SPB generally receives a discount of 40% to 50% off the US retail (cover) price. Payment terms: Please provide the SPB with a copy of your discount schedule or wholesale price list for your product line. Standard terms are Net 30, and the SPB is willing to take advantage of any early payment discounts of 2% or greater. By law, state agencies are prohibited from pre-payment for any product, samples, or any work toward the development of products. The SPB pays all invoices 30 days after the latter of receipt of goods or receipt of invoice. Minimums: Please indicate minimum requirements on opening orders and reorders. This will enable us to structure our purchase orders to meet your requirements. Shipping responsibility: Shipping charges to our warehouse or stores are pre-paid by the vendor and included on our product invoice. Although most products are shipped via UPS or other private commercial shipper, we prefer to be shipped via "best method" for all heavy or oversize orders. Orders being shipped by a private trucking company must be arranged through our Purchasing Coordinator prior to being shipped. The SPB reserves the right to refuse any shipments not arranged in advance. Physical sample: Your submission should reflect one complete sample of your product, with packaging included. Please note that all samples submitted for review become the property of the SPB unless specified otherwise in advance. Return request of samples must be accompanied by a pre-paid UPS return label. Arrangements for personal pick-up may also be made. Catalog: Catalogs, along with appropriate product information and wholesale price list, may be submitted in lieu of, or in addition to, any samples. Digital images: Digital images, along with appropriate product information and wholesale price list, may be submitted in lieu of, or in addition to, any samples. NOTE: Submittals in any form must be accompanied by a Vendor Information Sheet. A detailed description of all products and a complete price list must accompany all submittals. Please also include your company's terms and conditions as well as any other pertinent ordering information; this may include minimum opening order amount, minimum reorder amount, standard delivery schedule, etc. Digital images: Images may be supplied in JPEG, PNG, TIFF or EPS formats. Resolution should be 300 dpi at 2" x 3". Smaller files (under 15 MB) can be transmitted as attachments via email; larger files should be sent on CD-ROM or shared via Dropbox. Photographs: Slides, transparencies, and photographs are all acceptable. All images become the property of SPB and cannot be returned. Once your submissions package arrives, your product is evaluated by members of our Product Review Committee according to the product selection criteria listed at the beginning of this document. The SPB receives a high volume of product submittals and diligently reviews them all according to the Product Selection Criteria to determine their sales potential. If, for any reason, we choose not to solicit your product and you have completed all of the steps of the submission process, you will receive a letter from us stating the reason for our decision and a pledge to keep your information on file should circumstances change at a later point in time. If your product has been selected for solicitation, you will be contacted by the SPB Purchasing Coordinator to pursue the terms and conditions of the purchasing process. Please be sure to include complete contact information with your submissions package including name of contact, address, phone, fax and (if applicable) URL and email address. Failure to submit complete and accurate information in the Submissions Package can be grounds for immediate termination of the review process.